This fall, Discovery invites viewers to climb aboard powerful locomotives barreling across awe-inspiring landscapes, as the network’s original Canadian series MIGHTY TRAINS returns with an all-new picturesque season, airing Sundays at 7 p.m. ET / 4 p.m. PT beginning Oct. 14 on Discovery and the Discovery GO app. The second season of MIGHTY TRAINS highlights the network’s nationwide free preview, available Oct. 4 – Nov. 1 through TV service providers across Canada. Each one-hour episode of MIGHTY TRAINS is a journey into the fascinating world of rail travel, as host Teddy Wilson tells the stories of six exceptional trains and their scenic locomotive routes through Canada, Ecuador, India, New Zealand, Sweden, and Spain. Wilson follows the inner workings of these unique rail journeys with immersive and in-depth accounts from train drivers, load-masters, head chefs, track inspectors, rail traffic control officers, and passengers. Discovery also announced today that production is underway on a third season of MIGHTY TRAINS. Discovery’s free preview is available for four weeks – Oct. 4 to Nov. 1 – through television service providers across Canada, including Bell, Bell Aliant, Rogers, Telus, Shaw, Shaw Direct, Eastlink, Cogeco, Videotron, BellMTS, SaskTel, and others. Rocky Mountaineer takes viewers on a scenic journey across Western Canada and over the Rocky Mountains from Vancouver to Banff. This spectacular journey through British Columbia and Alberta gives passengers breathtaking views of some of the country’s most stunning landscapes, from glittering oceans to untamed wilderness. Also, as the only passenger train on a railroad line packed with enormous, fast-moving freight trains, Rocky Mountaineer’s 16-cylinder locomotive uses its 3,000 horsepower to pull the train up the steep grades of the Rocky Mountains. So far, Rocky Mountaineer has travelled more than eight million kilometres – that’s more than 15 times around the world! Tren Crucero takes passengers on a four-day trek from the southern coastal plains of Ecuador into the Northern Andes Mountains. Along the way, passengers take in the beautiful landscapes and enjoy daily excursions exploring Ecuadorian culture. It all begins in Eloy Alfaro, the capital of Duran, in the province of Guayas, aboard a restored, hundred-year-old steam locomotive. The train climbs into the clouds en route to its final destination of Quito, one of the highest capital cities in the world, 2,850 metres above sea level. The 240-ton Tren Crucero follows a narrow-gauge line, traversing the Guayas River, traveling across rice fields and through plantations of bananas and sugar cane. The train traverses deep tropical jungles, stretches of mountains, dry forests, and the banks of the Chanchán River, hugging the Andes. Voted “The World’s Leading Luxury Train” in 2012, 2013, and 2014, the Maharajas’ Express is made up of 23 carriages, including 14 sleeper carriages (each named after precious stones) for up to 88 guests, as well as dining cars, bars, lounges, generators, and a presidential suite that extends across an entire carriage. The train is outfitted with hydraulic brakes, a unique ballooning system to cushion the ride, and an onboard water filtration plant. Passengers are greeted with a red carpet, and attended to by private butlers and an around-the-clock concierge service. Running through the night, the crew works tirelessly to ensure the entire experience is seamless. The Maharajas’ Express is not only the most luxurious train in India, it is also one of the longest (one kilometre from end-to-end), making it all the more demanding for the staff on board to keep up. Subscribers can access live streaming of MIGHTY TRAINS through the Discovery GO app, and stream Season 1 on demand on the Discovery GO app and Discovery.ca. MIGHTY TRAINS is produced by Exploration Production Inc. (EPI) in association with Discovery Canada. Series Producer is Joey Case. Bruce Glawson is Executive Producer. Kelly McKeown is Director of Production. Nanci MacLean is Vice-President, Bell Media Studios and President Pinewood Studios. The in-house house cleaning at Bell Media, sadly, continues. 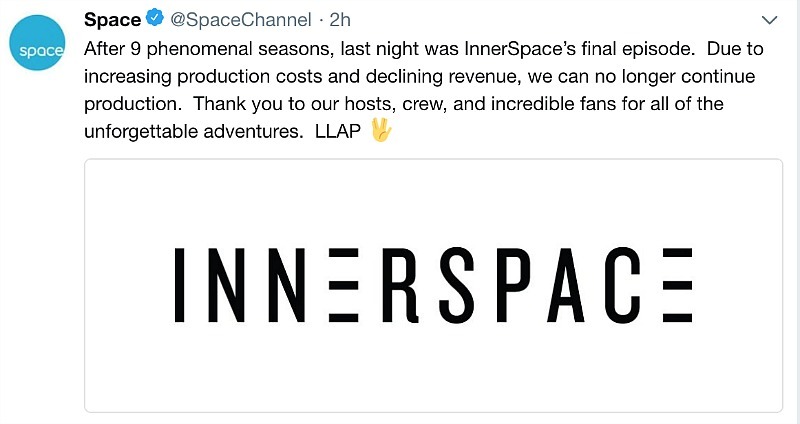 It was announced Thursday afternoon that InnerSpace has not been renewed on Space. InnerSpace co-hosts Teddy Wilson and Ajay Fry took to Twitter to address the show’s viewers. Hosted by Wilson, Fry and Morgan Hoffman, InnerSpace has been the go-to Canadian TV series for all of your sci-fi and fantasy news, television and movie reviews and exclusive interviews and set visits. 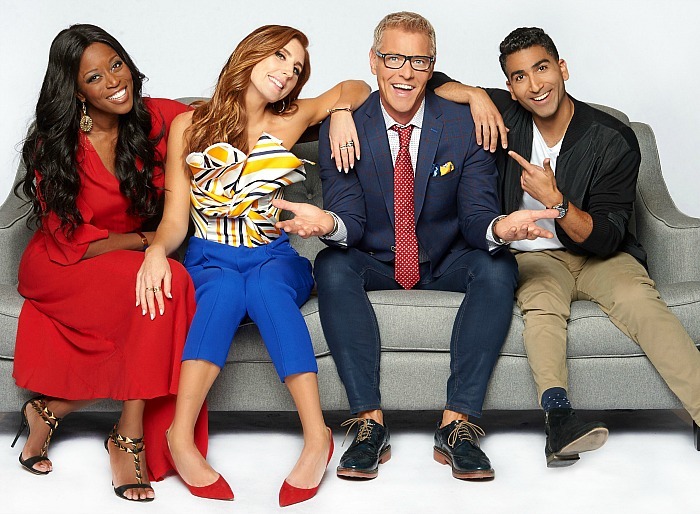 The news comes a day after Bell Media announced it would not be renewing Daily Planet and on the heels of CBC cancelling its daily talk show, The Goods, after two seasons. Are the Canadian networks pulling the plug on all in-house production? It sure seems that way.